A new wireless smart sensor called CliQ, designed for home automation and modern living has been launched by Kickstarter this week by a group of developers called The Team at BioSensics. 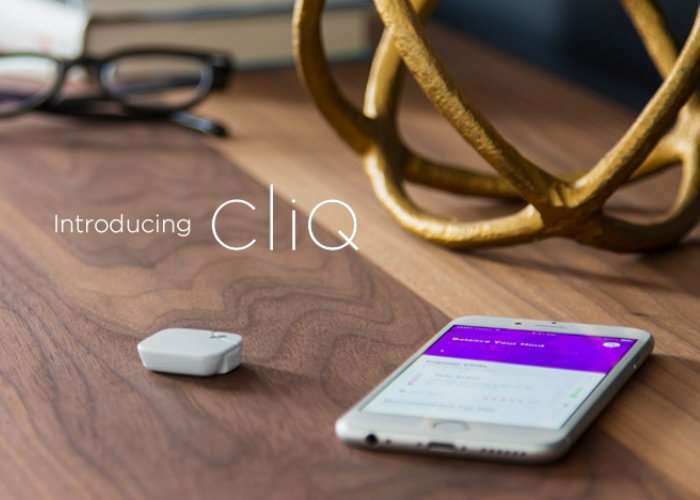 CliQ as a smart wireless sensor that is capable of transforming everyday objects into smart devices and is supplied with its own companion application allowing you to manage, improve and track both belongings and data about your daily lifestyle. Watch the demonstration video below to learn more about CliQ which is nearing its pledge goal of $50,000 thanks to over 125 backers with still 37 days remaining on the Kickstarter campaign. CliQ is a smart wireless sensor that turns everyday objects into smart devices. With CliQ you can track, manage, and improve your life. CliQ changes the way you interact with the objects around you and enables your world to react and communicate back to you. This empowers you to automate, track, manage, and improve your life. CliQ knows when it moves, so you can program CliQ to turn on the lights when you open the door, start your music when you get moving, or to notify you when your valuables are moved. CliQ enables you to control your world with just a click of a button. Automate everything from your smart home devices to the apps on your phone; or track your routines like feeding your plants and animals or your progress toward your fitness goal. CliQ can help you do all these things and so much more. CliQ is now available to back via Kickstarter with early bird pledges starting from just $34 and delivery expected to take place during August 2018. For full specifications and more information jump over to the official Kickstarter campaign page via the link below.